Recently, GOP state legislators have come up with a number of, er, creative ways to attack abortion and reproductive health. There are the efforts to defund Planned Parenthood, the Nebraska copycat laws (which ban abortion after 20 weeks, and were enacted in five states in 2011), the TRAP laws, the “Heartbeat” law, the “personhood” debate, not to mention ongoing efforts to dole out misleading information to women seeking abortions. 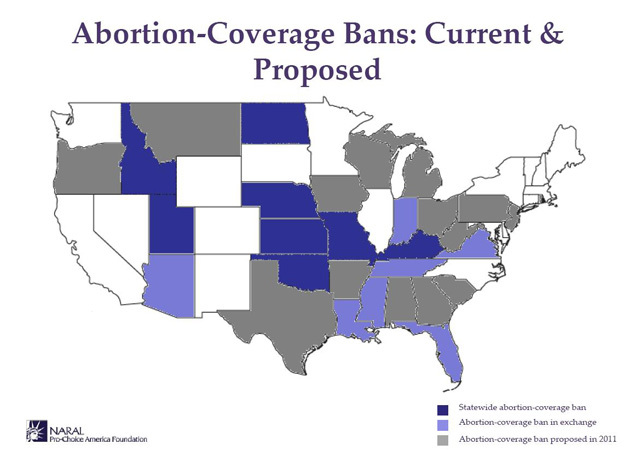 There’s also been an incredible surge in state efforts to keep insurance companies from funding abortions—to date, 15 states have enacted some type of ban, and another 15 states have proposed bans this year. Below, bans “in exchange” (light purple) pertains to insurance plans mandated by federal health care reform, including private plans. Kansas: The First Abortion-Free State?